The moment you’ve been waiting for is almost here. And I don’t mean the vSphere launch, I mean something far more important than that. 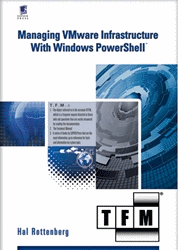 Hal Rottenberg’s definitive guide to managing VMware with PowerShell is almost here. Hal’s book has lots of great tips that cover everything from installation and configuration to maintenance and reporting. You can pre-order your copy now. It makes a great gift, so order two. This entry was posted in Uncategorized on April 2, 2009 by Carter Shanklin.